It’s funny: I always imagined when I was a kid that adults had some kind of inner toolbox full of shiny tools: the saw of discernment, the hammer of wisdom, the sandpaper of patience. But then when I grew up I found that life handed you these rusty bent old tools – friendships, prayer, conscience, honesty – and said ‘do the best you can with these, they will have to do’. And mostly, against all odds, they do. In the midst of a difficult season a friend picked this book for the book club that used to meet in my home every month. It was the first in a series of books by authors who identify themselves as Christian that I could relate to. Anne has lived a life so very different than my own. Or at least that is how it seemed. And then you realize that human experience is human experience. Her feelings of being different. Her talent. Her knowledge that there is a source but not being certain what to call him or her. Her honest angst at the state of the world. And her ability to find the hope in the midst of it all. 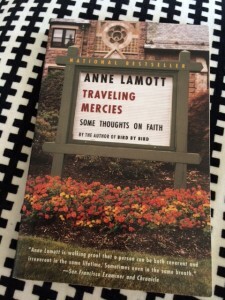 Once I began diving into all that is Anne Lamott, I became a fan. She is on my short list of people to eat dinner with. I will move heaven and earth to hear her talk. I still get silly when I think of her borrowing my phone at a reading to read a poem or telling me to ‘sit down…I hate lines’ at an event last year. If I knew what a “fan girl” was, I’d guess Anna Lamott is the closest thing to bringing that out in me.